But that’s what we did this summer. 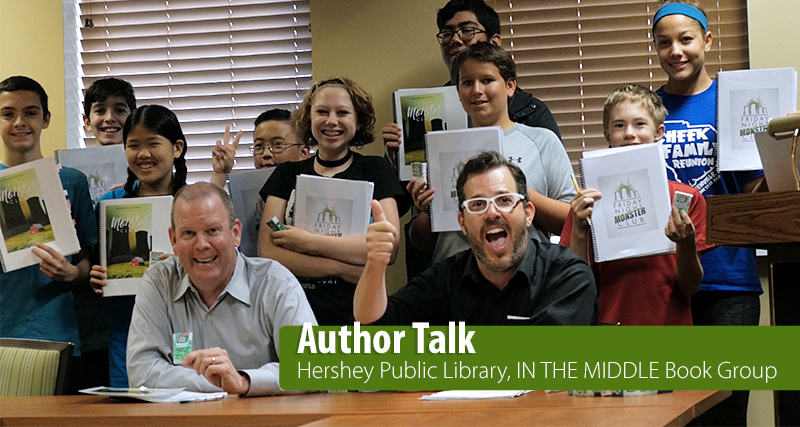 And then on Wednesday we sat down with fifteen bright, insightful, and all-around-delightful kids at the Hershey Public Library’s “In the Middle” book club and discussed the inner workings of the Friday Night Monster Club. What a blast! These kids were awesome. They asked all kinds of interesting questions, and engaged in a wonderful and glimmering discussion. “Why did you choose this detail?” “Is this character going to be important in the next book?” “Are you giving us clues where the monsters are coming from?” Of course, having read the book, they asked in a lot more detail. Right out of the gate we had a lively back and forth about the significance of Tic Tacs to the overall theme. Suffice it to say, it was extremely gratifying for us, and I hope for the kids as well. More details to follow, but it’s safe to say for now that we passed the sniff test!